Temporary log cabin or a permanent one? 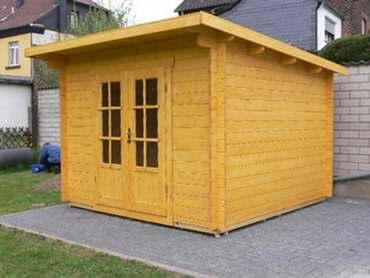 Whether you need a temporary log cabin or one which will last indefinitely, really depends on exactly what you intend to use it for. It also may depend on if you would have any alternative uses for it, if your primary reason for using it no longer is relevant. In some cases it obviously pays to buy a really cheap log cabin that fulfils a role for a short time before becoming obsolete. However in many cases the decision is not so clear cut and if you are investing good money into a project anyway, would it be wiser to spend more on a quality log cabin, that will last a lot longer? Only you can answer that question, but we hope this section may help to crystallize your decision making process! Should You get a Temporary Log Cabin or not? Temporary Log Cabin – What is it? Now whilst no one would sell their log cabins as being temporary, the fact is there is little point in spending a lot of money on something which perhaps has very low usage or is only needed for a short time. In these types of situations the quality of your log cabin may be less of a concern than the price! So if you need a short term log cabin solution then what you need to use it for, will help you to decide which type would be best to go for. Temporary Log Cabin – What is it for? When deciding whether you should get a temporary log cabin or more permanent one, the ultimate use you a proposing for your log cabin will be a big consideration. It is for occasional use in the summer time, the specification obviously needs to be much lower than one which is regularly used in the winter. There may be certain situations, like a granny annexe for example, where you wouldn’t want to compromise on quality, because you want the person using it to be very comfortable. In this scenario the quality, rather than the bottom line cost will become a bigger influence. In the situation where quality is very important, but the use you have planned for it is only for a few years, then it may pay to plan well ahead and consider what alternative uses it could be put to, (once the original plan has reached it conclusion). With this in mind while you are going to the effort and cost of building a log cabin, it could well be intelligent to think about family needs further down the line. A more flexible and open type of design may lend itself to other uses in the future. For example a granny annexe may one day make a great place for a games room, or perhaps as extra accommodation for visitors. Temporary Log Cabin – Build quality? Log cabin build quality does vary considerably, as does the price. As with most major purchase decisions in life, the compromise between price and quality always exists to some extent. 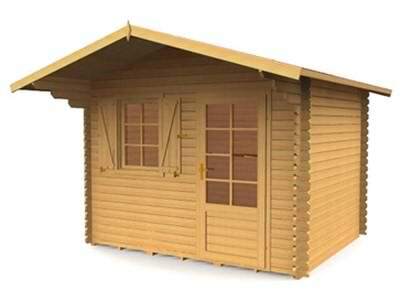 With log cabins there is such a massive range, from a very thin mass produced garden shed type of cabin, to a hand scribed individual cabin with huge logs! Whilst most log cabins should last a long time with the correct maintenance, I have the opinion that top quality log cabins will last for generations, where as very cheap log cabin are designed with a shelf life in mind. The single most important aspect is the quality of the logs themselves, which is largely down to the timber they are made from. There is more on this in other sections but even a few simple checks can reveal huge differences between logs. Whilst if you are only looking for a temporary solution the log quality may not be as important as say looking to build a permanent log house, it stills pays to compare similarly priced products and see which offers the best logs! High specification windows and doors are pricey too, so check these well, as cost savings may have resulted in low quality units being supplied. Temporary Log Cabin – Other factors? Temporary or not, one thing you should never neglect with a log cabin is the base or foundation it sits on! Logs located too close to the ground will often result in premature deterioration. Also insufficient support or damp proofing can cause problems as well. Take a look at our foundation section for more information on this. If you intend to take a log cabin down after a certain amount of time and rebuild it, make sure you can actually do this. Generally the much thinner machined type logs will come apart much easier, where as even thicker machined logs will be very difficult to dis-assemble. Most log joints at the intersections with other walls have an interference fit, which means they will not come apart easily. Combine this with wooden dowels or long screws going from one log to the next, and it becomes even harder! The reality can be that you will cause a lot of damage to the logs trying to get them apart, to the extent that both its visual appeal and its physical performance could be compromised. Always check if you plan to take down your log cabin, that it has been designed and manufactured with this in mind in the first place.